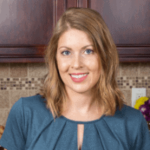 Published: Jul 27, 2018 · Modified: Aug 15, 2018 · By Jen Sobjack · This post may contain affiliate links. We had an incredible experience swimming with whale sharks in Cancun, Mexico. They return to the same place every year between May and September to feed on plankton and we jumped at the chance to go snorkeling with these gentle giants! Have you ever watched a nature documentary with divers swimming alongside massive fish called whale sharks and wished you could do the same? I have! It was a dream of mine since I was little. I loved watching the Discovery Channel and would be become so fixated on anything that dealt with the ocean and marine life. I really think I missed my calling in life. 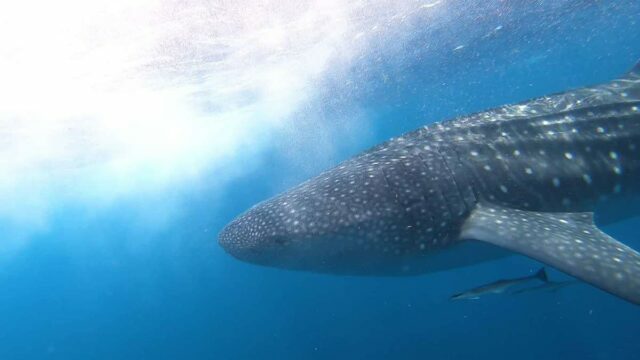 Anyhow, I had no idea that you could actually travel to certain locations during specific times of the year and go snorkeling with whale sharks. Mind Blown! Once I learned this was a thing to do, I spend several hours researching the best tours and locations. It must have been fate because I happened upon a company that specializes in eco-travel and they had tours going on from May to September. EcoColors offers nature, adventure and scientific tours such as diving, snorkeling, swimming with whale sharks or turtles, and much more in the best destinations in Mexico. 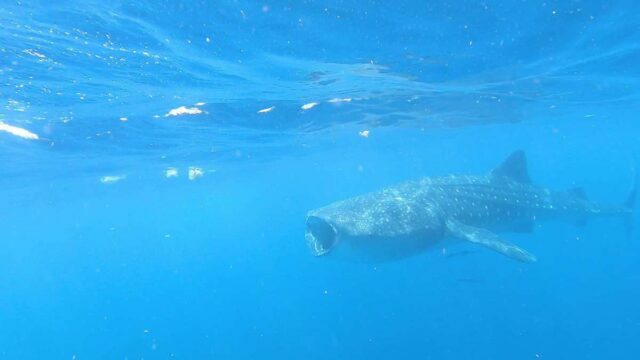 We chose to use this company for the whale shark tour in Cancun, Mexico because they have more than 18 years experience. The tour lasted around 7 hours but we were not in the water the entire time. It was about an hour and a half ride from the marina to the whale shark reserve. I should mention that if this is something you plan to do, be prepared for seasickness. Take Dramamine before you arrive at the marina and bring extra on the tour just in case you need it. 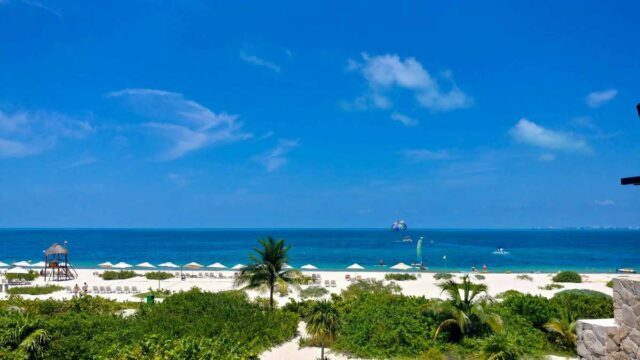 The best value for your money is to stay at an all-inclusive resort. You get all the food, drinks, and entertainment you need. 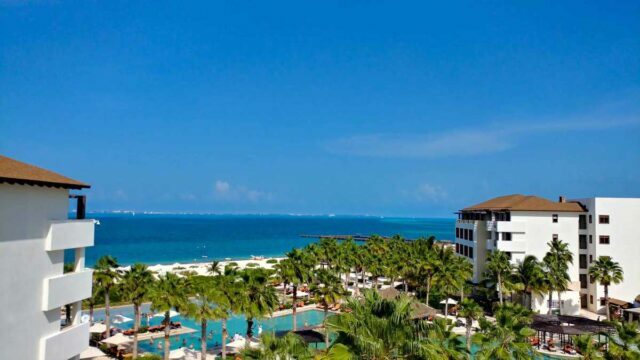 Secrets Playa Mujeres Golf & Spa Resort is where we stayed and we couldn’t have been more pleased with the location. It was outside of Cancun but only 10 minutes from the EcoColors Marina where we went swimming with whale sharks. We booked our resort reservation through Cheap Caribbean which was the best idea ever. They handle booking your flight and arranging your transportation to and from the airport. Just be sure to select those options as you’re making the reservation. There is an extra fee for transportation but it isn’t much and it’s so worth it. Once you receive the confirmation email, read it all the way through. It will give you detailed information about what to expect once you enter Mexico and how to find your transportation. This is important to know beforehand because you will be bombarded at the airport with people offering your rides, excursions, and timeshares. 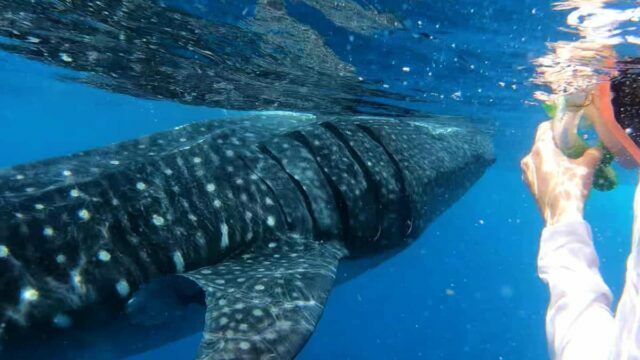 Now go swimming with whale sharks and have the adventure of a lifetime!